Princess Marie-Chantal of Greece attended the gala in 2001, when the exhibit was Jacqueline Kennedy: The White House Years, and she stuck to the theme in the most indisputable way: she wore a Jackie dress. She attended with her friend (and wedding gown designer) Valentino. 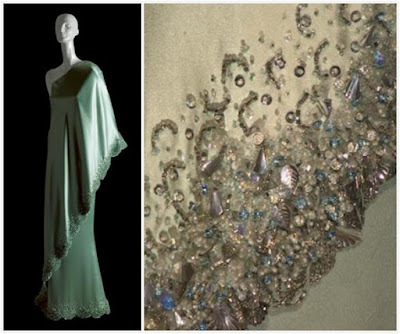 This minty green one-shoulder satin gown with embellished hems appeared in a 1967/68 Valentino couture collection, and was worn by Jackie Kennedy during a visit to Cambodia in 1967; the gown was later worn by Marie-Chantal to this event. Another version was worn after that by Jennifer Lopez to the Oscars in 2003. It was a dress on point for the evening, but also a dress just on point forever and always. The draping seems so easy, but it's really excellent craftsmanship and top-notch fabric at work, and the beading is a wonder. These days I often prefer those who go big or go home as my Met Gala bests (hello, glow-in-the-dark Cinderella gown), but there's always a gold star for those who handle the theme in the loveliest of fashions. P.S. : Still in the Met mood? Last year we talked Diana at the gala!